What's life without a little arm candy? Piaget is once again demonstrating its ability to merge its watch and jewellery making expertise. It is launching several glittering new iterations of its Possession Watch, which had first been introduced last year as the timepiece counterpart to its iconic Possession jewellery collection. The watches in the collection all have a freely-rotating bezel that mimics the rotating rings on the jewellery. This year's newest iteration features has the watch mounted on a new pink gold Milanese mesh bracelet. The bracelet is hand-finished by Piaget's master artisans and given a subtle texture that catches the light as you move your wrist. If that isn't enough glitter, however, the watch also comes with a gleaming mother-of-pearl dial and 11 diamond indices. The 29mm bezel is also fully paved with a total of 126 brilliant-cut diamonds. Richard Mille's latest BonBon collection makes us want to stick our hands into the candy jar. It features motifs of much-beloved childhood sweets such as marshmallows, lollipops and cupcakes, as well as fruits—also known as nature's candy—such as lychees, kiwis and strawberries. The entire collection was designed by Cécile Guenat, a trained jewellery designer who was brought on to be the creative director for the new line. This specimen, the RM 07-03 Marshmallow, is crafted to look just like the pillowy candy. Its playful exterior, however, belies the difficulties faced in its creation. Each section of its puffy pastel dial is crafted from at least a dozen layers of grand feu enamel. The technique first involves creating shallow depressions out of white or pink gold and filling them with enamel powder. Because each layer of enamel powder must be fired at a high temperature of 800 degrees celcius before the next layer is applied, the entire process is extremely laborious. Plus, shrinkage and cracks are common at every firing, so the rejection rate is exceedingly high. Once the enamel sections are finished, they are sanded to give the soft-looking surface texture of a real marshmallow. The case of the RM 07-03 Marshmallow is made from a combination of white ATZ ceramic and lavender pink TZP ceramic. Both are extremely scratch-resistant, unlike the real candies. The sides of the case are made from red gold, polished by hand and set with tsavorites, pink sapphires and citrine. Shapely watches are a Cartier speciality—just think of the iconic Tank, Santos, or Panthère watches. A strictly round watch is out of the question for the French maison, which is perhaps one of the reasons why founder Louis Cartier first created the watch in 1912. As the story goes, Louis Cartier took the regular round shape and stretched out its proportions, resulting in an oval watch shaped like a baignoire (which means bathtub in French). The collection has been in Cartier's repertoire for years how, but has been refreshed in 2019 to great effect. The new Baignoire small model in yellow gold, pictured above, is at once stylish, elegant and cute. Its curved lines extend to the mildly concave shape of the watch, which allows it to conform smoothly and comfortably to the shape of the wrist. It also has Cartier's signature Roman numerals and cabochon-set crown. Its quartz movement is also ideal for those who prefer a lower-maintenance timepiece. For those who are after something more high-impact for evening wear, we recommend looking at the white gold version of the Baignoire small model, which comes with a bezel set with two rows of brilliant white diamonds. Both small models come on alligator leather straps. Jaeger-LeCoultre is best known for its exceptional watchmaking prowess; it is often called the watchmaker of watchmakers, having created movements of the likes of Patek Philippe, Audemars Piguet and Vacheron Constantin. This year, however, it is also giving air-time to its ability to expertly and precisely decorate its watches, with the theme for the year being 'The Art of Precision'. This timepiece, called the Night & Day Jewellery, is part of its existing Rendez-Vous collection of women's watches. The night and day function is simple, indicating the hours of day or night so that you will never have to wonder whether it is 5pm or 5am. The watch itself is decorated superbly, with the most noticeable being the double row of diamonds on the bezel. The settig of the outer ring is particularly difficult, as it uses a special type of prong setting. As each prong must be cut out of the solid block of gold (and not welded on), the setting is quite time-consuming and requires a high level of expertise. The sun and moon on the day or night ring is also beautifully decorated with gold cut-outs of the moon, sun and stars. The watch houses the automatic 898B/1 calibre. Hermès' longstanding relationship with the world of equestrian riding is well-established; it started out as a marque manufacturing saddles and harnesses for well-heeled riders, after all. 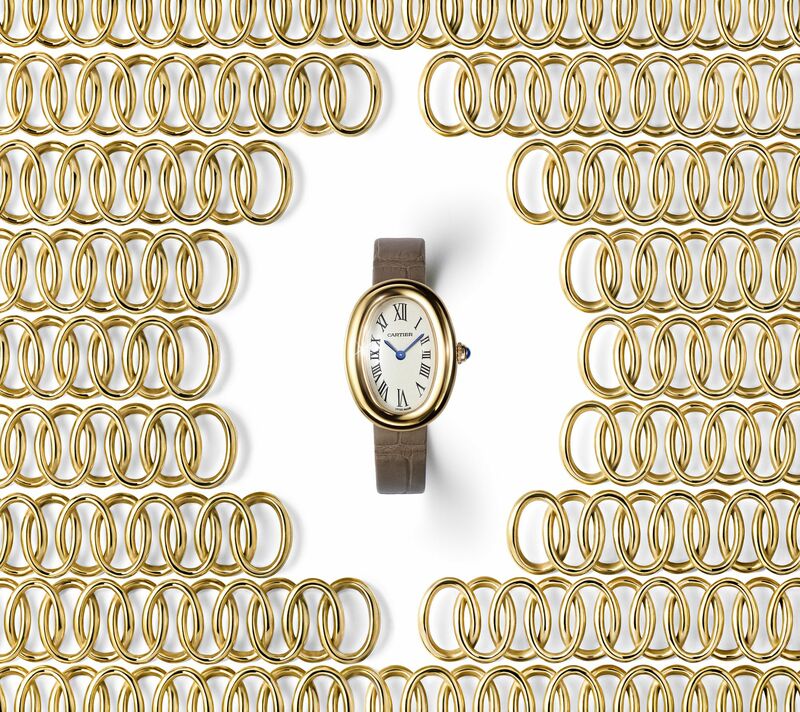 It comes as little surprise, then, that its newest watch, the Galop d'Hermès, also takes inspiration from riding tack. Created by Switzerland-based designer Ini Archibong, the shape of the watch resembles that of astirrup, one that has been polished and refined by expert artisans. Archibong wanted to create something that didn't need diamonds to shine brightly, so each facet of the watch is carefully angled and smoothly polished to always catch the light, giving it an almost aerodynamic look and feel. Archibong also moved the crown (usually positioned at 9 o'clock) to the bottom of the case so that it would not disrupt its sleek lines. He also designed the typography of the numerals on the watch, which taper smaller towards the narrower top of the watch, and become wider at the bottom. The top half of the numeral 8 is also cheekily shaped like an inverted stirrup. The result is a watch that is unapologetically contemporary and playful. The watch is available in steel or rose gold, and with or without diamonds. This whimsical piece from Girard-Perregaux is an excellent example of feminine watchmaking. The Cat's Eye collection is the brand's dedicated line for women's watches, and fresh iterations never fail to please. The oval shape of the watch case is contrasted against the round recessed inner dial, which is made of white mother-of-pearl. The outer dial is similarly made of mother-of-pearl, but has been deftly engraved with a tapering ridged pattern. The difficulty here lies in that mother-of-pearl is a very delicate material, prone to scratching and breaking easily. For the brand to create such a piece indicates that its artisans are very skilled indeed. The painted mother-of-pearl plum blossom at 9 o'clock is also a charming accent to the piece. While it may just look decorative, it actually functions as a small seconds counter, rotating about its axis once every minute. Parmigiani is refreshing the look of its original Tonda 1950 Lune, which originally debuted two years ago. This new version features a brand new asymmetric dial layout that adds an element of interest to the elegant design. The dial has the moonphase indication placed at 10 o'clock (instead of 12 o'clock like the original), and the curving date window is placed at 4 o'clock instead of 6 o'clock. Instead, a small seconds subdial at 6 o'clock maintains balance in the design of the dial. The dial, which is crafted from mother-of-pearl, has also been reduced in size to widen the amount of space available on the bezel so that it can be set with glittering diamonds. The Tonda 1950 Lune houses the ultra-slim PF708 self winding movement, which is made in-house, measures a mere 4mm in thickness, and has an engraved gold micro-rotor that is visible through the sapphire glass caseback. Because of Parmigiani's commitment to excellent hand-finishing, we can assure you that the view of the movement from the back is just as beautiful as the view from the front.